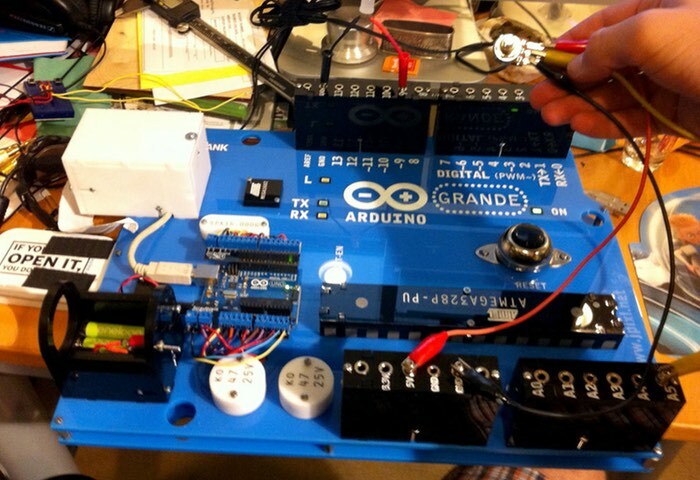 Anyone who enjoys using an Arduino development boards but find them a little small and fiddly, may be interested in the Arduino GRANDE which has been created by John Edgar Park especially for the Maker Faire Bay Area. The larger-than-life Arduino GRANDE development board has been created using 3D modelling software laser cut acrylic together with a few other components such as buttons and LEDs. 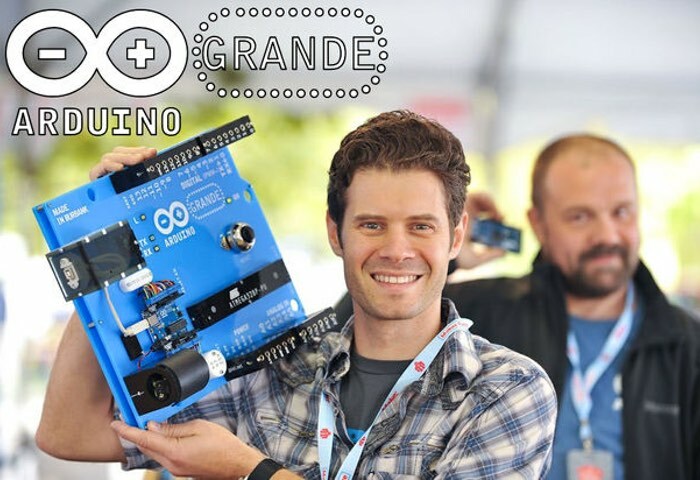 If you would like to create your very own Arduino GRANDE its creator has now published full instructions via the Instructables website. The chip is just for show, but the power jack will eventually hide the batteries, and the USB port will be made functional by the addition of a panel mount USB jack. Insert the banana jacks into the female header blocks and then thread the nuts on to hold them in place. A dab of Loctite will prevent them from loosening up later. On each banana jack, solder a length of wire sufficient to route through the board to the real Arduino. Push the wires through to the underside of the board at the header location, then insert and assemble the header blocks with screws and nuts which will be held captive in the acrylic t-slots.The reset button (originally sold as a doorbell) needs to have two long lengths of wire soldered to it, which are then fed through the board to route to the real Arduino. The same goes for the panel mount rectangular LEDs. Attach a real Arduino Uno to the board, and then run all of the header, reset, and LED wiring to it, and plug in the USB cable. You can use a ScrewShield to prevent wires from falling out. Full disclosure, I’m one of the creators of the ScrewShield and will make a little bit of money if you buy one. Hide a 4xAAA battery pack inside the [cardboard] barrel plug, and then run it through a switch to GND and Vin on the Uno to power the Arduino GRANDE. You can now upload a test sketch and try things out! I wired banana plugs to resistors, 10mm LEDs, potentiometers, speakers, buzzers, servo motors, and other typical components to plug into the GRANDE.